For the homeschooled - special needs student. Professional looking IEP's specific to the needs of your student are now a snap! 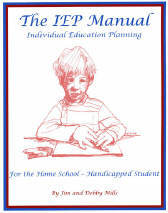 This IEP planner is made specifically for the special needs student. Very easy to use! Menu of IEP goals. - Chronological age-appropriate activities for students with challenges offers a great menu of different ideas. "Spring board" for ideas. - To function as a resource for designing adapting , and validating skill requirements. Listing of professional terms - Terms that the professionals use and what they mean to us on an ordinary level. Such as "fine motor skill" = "folding socks". 200 Pages - Printed on high quality paper with a durable heavy paper cover.